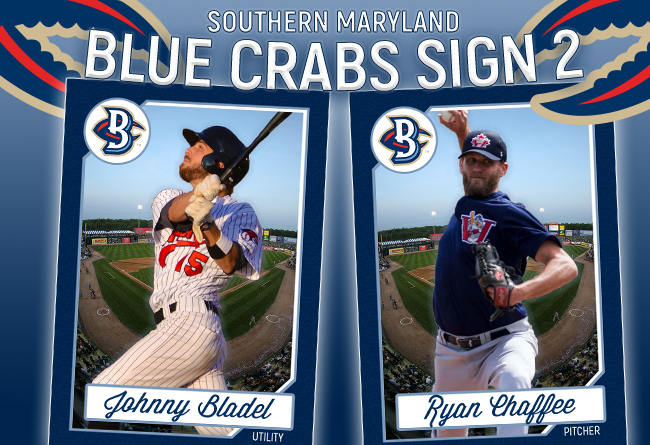 (Waldorf, Md., Feb. 21, 2018) - The Southern Maryland Blue Crabs have announced the signings of two Atlantic League newcomers, outfielder Johnny Bladel and pitcher Ryan Chaffee. Bladel comes to Southern Maryland after an All-Star campaign in the Canadian-American Association during the 2017 season. The versatile outfielder led the New Jersey Jackals offensively, while posting league-high totals in runs scored, hits, stolen bases, doubles, and triples. Bladel’s 95 runs scored were the most all-time in a single season for Can-Am history, while his 135 hits tied him for second all-time. The James Madison alum went undrafted out of college in 2013, signing his first professional contract the following season in the Pecos League. Bladel appeared in 77 games between the Pecos League and the American Association in 2014, batting .449 on the year with 13 homeruns and 21 stolen bases. The right-hander is a career .339 hitter, while averaging over 20 stolen bases and 70 runs scored per year across his four professional seasons. A nine-year vet on the hill, Chaffee joins the growing Blue Crabs pitching staff for the 2018 season. After playing at Chipola Junior College, he was drafted in the third round of the 2008 MLB Draft by the Los Angeles Angels. The 29-year-old was named a Mid-Season All-Star with Cedar Rapids in 2009, his first professional season. Prior to the 2010 season, the right-hander was named as a top 20 prospect in the Angels organization. In total, Chaffee has spent eight seasons in the minor leagues, six with the Angels and two with the Miami Marlins, reaching as high as AAA. In the 2012 season, Chaffee averaged over a strikeout per inning, en-route to a 7-1 record with a 2.60 ERA. The Nebraska native joined the Winnipeg Goldeyes of the American Association for the 2017 season. Serving as the team’s closer, he went 3-3 with a 3.26 ERA, picking up 21 saves to tie him for second in the league.